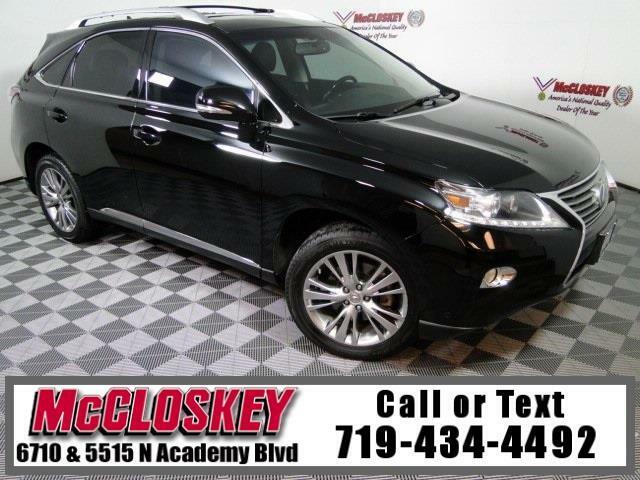 Luxurious and well-appointed 2013 Lexus RX 350 All Wheel Drive with Navigation System, Blind Spot Detection, Power Moon Roof, Heated and Cooled Leather Seats! Standard equipment includes 18-inch alloy wheels, automatic headlamps, foglamps, LED running lamps, rear privacy glass, heated mirrors, a power liftgate, keyless ignition/entry, dual-zone automatic climate control, eight-way power front seats with two-way adjustable lumbar, a leather-wrapped power tilt-and-telescoping steering wheel, a sliding and reclining rear seat, cloth upholstery, an auto-dimming rearview mirror, Safety Connect emergency communications, Bluetooth phone and audio connectivity, and a nine-speaker sound system with a six-CD changer, satellite radio and an iPod/USB audio interface. The 2013 Lexus RX 350 is powered by a 3.5-liter V6 that produces 270 horsepower and 248 pound-feet of torque. Message: Thought you might be interested in this 2013 Lexus RX.